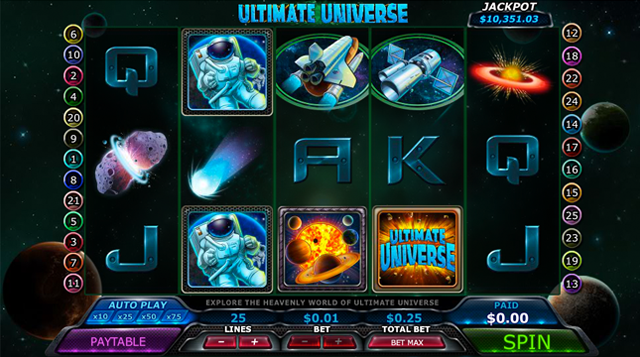 3, 4, or 5 Solar System Scatter symbols award 15, 25 or 50 free spins respectively. 3 or more Scatter symbols also award prizes. It is possible to win more Free Spins during free spin rounds. The Ultimate Universe Wild symbol substitutes for all other symbols except the Solar System Scatter symbol. Any win with one or more Ultimate Universe Wild symbols multiplies the prize x2. The Astronaut symbol is the highest paying symbol and can multiply the line bet up to *2500. This Video Slot has a progressive jackpot. The Jackpot prize is awarded randomly. No symbol combinations are necessary for winning. The probability of getting a jackpot is determined by the size of the bet and number of selected paylines. The jackpot growth rate is 3% of game bets. In addition, the house places a seed amount in the jackpot after every jackpot hit. All symbols pay left to right on consecutive reels (starting with the leftmost reel) except the scatter symbols. All wins are multiplied by the credits bet per line except for scatter wins which are multiplied instead by the total bet (depending on game). Scatter wins are paid in addition to payline wins. The combinations of Scatter symbols pays only the highest prize. Only the highest win will be paid on each of the active paylines. The BET MAX button selects the maximum number of lines and the maximum bet per line and automatically spins the reels. Please note that some games do not have Max lines or Max Bet options. In this case, you must manually select your lines and bet, then click Spin. To view the video slot machine’s different winning combinations and special features click Paytable or Info on the machine’s buttons panel. You can use the Autoplay option to have the computer spin for you. Choose a predefined number to activate the Autoplay immediately. You can stop Autoplay at any time. Autoplay pauses for bonus rounds and free spins and resumes once they finish.